The Toronto Enterprise Fund's Accelerator program provides participants with support to develop and refine early-stage employment social enterprise (ESE) ideas. Applications to the second cohort of their Accelerator are now open! The focus of this second Accelerator cohort is ESEs that will employ people with physical, developmental, and/or intellectual disabilities. Examples of this type of ESE include The Raw Carrot (a social franchise that makes gourmet soups and employs individuals on ODSP) and The Lansdowne Cone (an ice cream parlour that employs youth on the autism spectrum). Participants of the second Accelerator cohort will learn the nuts and bolts of the ESE model, refine their ESE idea through workshops and peer support, and have the opportunity to apply for up to $10,000 to fund a feasibility study and business plan. Interested in starting an ESE to support people with disabilities? 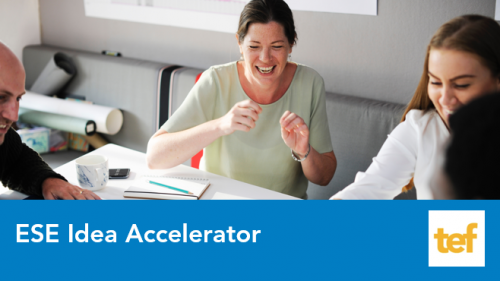 The Accelerator is open to organizations and individuals in Peel, Toronto and York Region. Learn more and apply for the Accelerator program today! Applications are due Friday, December 14, 2018 at 5:00 p.m. EST. Do you know someone that could be a great fit for the ESE Accelerator (Disability Focus)? Please pass this email along to them and encourage them to reach out to us! If you have additional questions, contact Courtney Ayukawa at cayukawa at uwgt.org. For the Catalyzing Grant, you must be able to attend the ESE Idea Accelerator Pitch Night on March 7, 2019 from 6:00 - 9:00 p.m. Accelerator Applications Close: Friday, December 14, 5:00 p.m.
Workshop 1: Tuesday, January 15, 9:00 a.m. - 12:30 p.m.
Workshop 2: Thursday, January 24, 1:30 p.m. - 5:30 p.m.
Workshop 3: Thursday, January 31, 11:15 a.m. - 4:15 p.m.
Workshop 4: Monday, February 11, 12:15 pm. - 4:45 p.m. Accelerator Pitch Competition: Thursday, March 7, 6:00 - 9:00 p.m.